The owner of Pu-erh.sk has kindly regaled me with a collection of tasty samples from I know not where. Or rather, I know not who pressed them - this particular sample, shown below, comes from the Bangpen area of Bulangshan. My mother, visiting for the week-end, read the packet and assumed it to say "stored in tinybag". 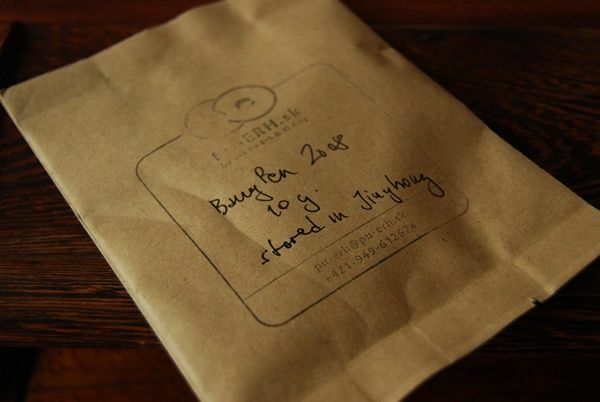 This is true - the sample bag is tiny enough - but it actually reads "stored in Jinghong", the capital of Xishuangbanna - a fine place to store a tea. Humid, warm storage is etched into the very core of this tea: the leaves smell of it, they look like it, and, ultimately, they taste like it. This is A Good Thing, in my opinion. 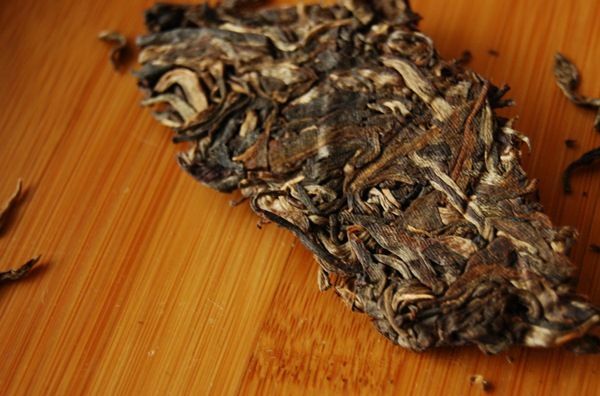 The result is something that has aged far beyond its four or five years, and yet which still maintains a great deal of its original Bulangshan potency. It is a fine balancing act, and one that this tea has managed very well. The first aspect of this tea that one might notice, even from the dry leaves, is its low, heavy base. 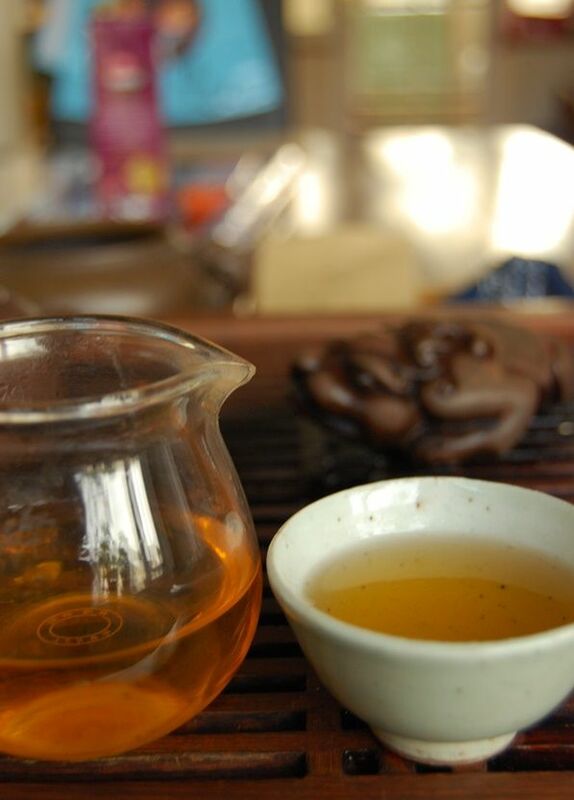 In the wenxiangbei [aroma cup], it is clear that the tea is of the "dark molasses" genre. Often, cheeky processing is performed to accelerate a cake in this direction, and yet this cake appears to have achieved its state while retaining the power than processing would otherwise sacrifice. As pictured above, this tea brews an almost adolescent orange, and yet it is still young. Such are the benefits of 'Banna storage, which, it must be said, differ considerably from the slowly-slowly approach that my cakes are currently taking, here in England. I am in no particular rush, but, even so, I do appreciate tea of this kind. Adolescence in a tea is an excellent place, to my taste buds: the harshness of youth (which I actually enjoy in shengpu) has been tempered a little, and yet the character has developed into something of a sharp woodiness, which, much later in its life, will deepen and turn into a richer, liquid mahogany (all being well). I have come to like that sharp transition stage; it has often been written of as being "drain cleaner", but it just goes to show that there is someone in the world to love you, no matter how you are. Or how astringent your huigan. The riddle of this mysterious cake, wrapped in an enigma as it is, remains unsolved due to the lack of information concerning who made it, etc. Yet, that really matters little when confronted with the fresh vibrancy of a cake that grabs the entire tongue with an energetic fizziness, and which brews for so many infusions, with such cleanliness and precision. Not once does it tend towards the rough or abrasive, despite the large quantity of leaves that I have used. 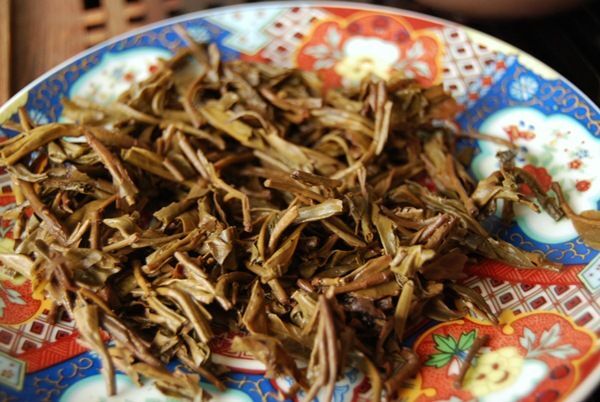 Its bright character suggests careful production, and its longevity and purity suggest good quality leaves. Is it more advanced in aged taste than the HLH Ban'E you sipped a few months ago? Or is it impossible to tell given the difference in Bana and English aging? Reading my notes for the "Ban'e" cake, I would say that this Bangpen has a different profile: it has the scorched darkness of intensely humid and warm storage, whereas my Hailanghao cake is much less towards that extreme. While I adore 'Banna storage, I wouldn't wish for my entire collection to have that same profile. Addendum: Peter's blog notes that this was made from a village quite close to the Banzhang / Man'e area (hence Shah's question, I imagine!). These cakes were made for some so-called Jinghong pu-erh fans club that my friend is/was a member of. He had this tea stored at his home in JingHong on 5th floor I think. Ive had this cake in my offer some 2 years ago but there was no suitable audience for at that time which I stored 1 in Slovakia. I bought only some 2 kg at that time. Ive checked with my friend some time ago and found out that he still had last 10 kg of these small cakes (200g). I decided to take them and offer some of them on my web site. They should be available in about 2-3 weeks time.